Long time no posts, I’ve been in the workshop working on new designs and moulds and had a baby so writing articles has very much taken a back seat. 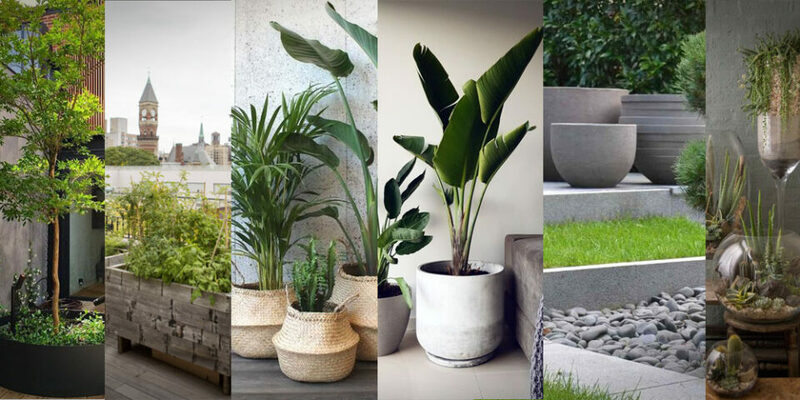 Anyway I thought it time to inspire and so have put together a collection of nice gardens from around the world to give you some ideas that might inspire some spring reorganising. December and January is a quiet time for gardening but often the seeds of planning for spring begin to germinate below ground so why not start here? Definitely not child friendly but very cool is this stepping stone path over a lily splattered pond. The garden is full of life and has a very wild feel where there is isn’t that much usable space but the ability to get lost and taken away after a hard days work is ample. Again another floating path over a pond but in a much more open way. The over growing grass breaks up the linearity of the path and pond edge and the social area in the distance is open enough to see the surrounding but given shade by the trees above. 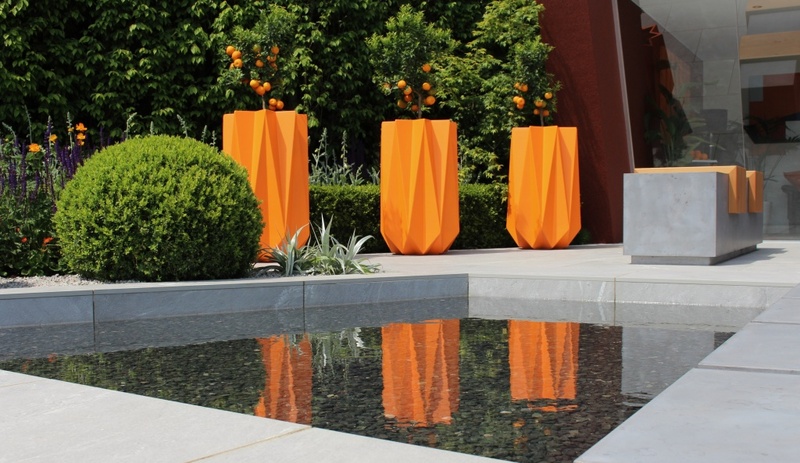 Jumping to the other side of the world now with Acre garden design and they have created a space fit for a french man and his bowls. With smatterings of green this is contrasting approach to the previous designs where usable space was not the focus. Here we see as much space as possible available to interact in and the greenery is used to break up the lines slightly and add some colour. The columns feel a bit Indiana Jones along with the swing and tall shrubbery but the over all effect is quite enchanting. You can imagine taking yourself back to being a kid and having a whale of a time playing here whilst your parent sat in those chairs. Inspiration here for the very few! 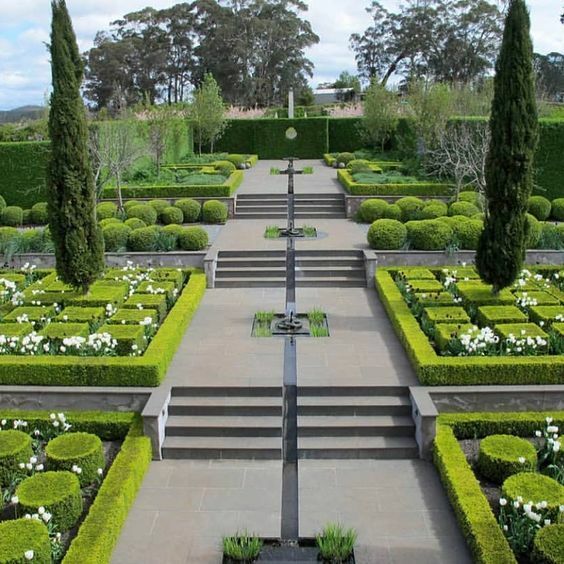 Some people manage to pull off a formal garden in a small space but they need a lot of work because what makes them look good is the neatness and nature isn’t neat. This though looks amazing and perfectly maintained but it is a little too far to go for a visit. 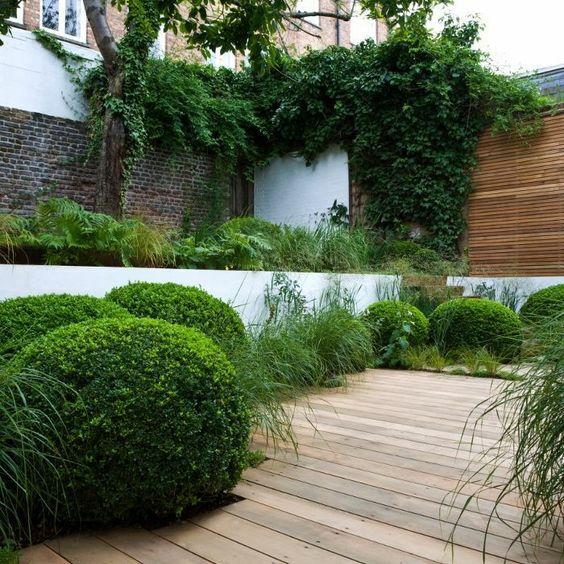 This garden in Kensington takes a bit from the formal and a bit some the previous so that if it isn’t perfectly maintained and the buxus hedges don’t get their regular haircut the garden still looks cool. 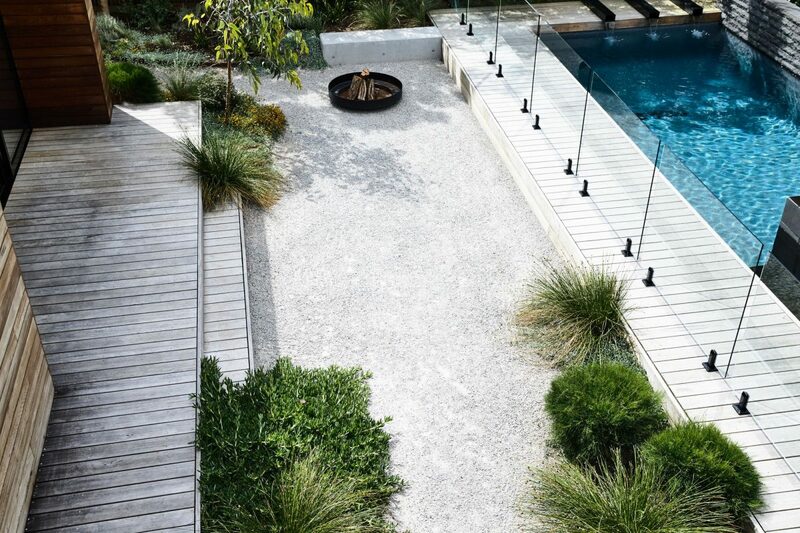 The shaggy looking grasses break up the formality and the intruding planting softens the deck space. 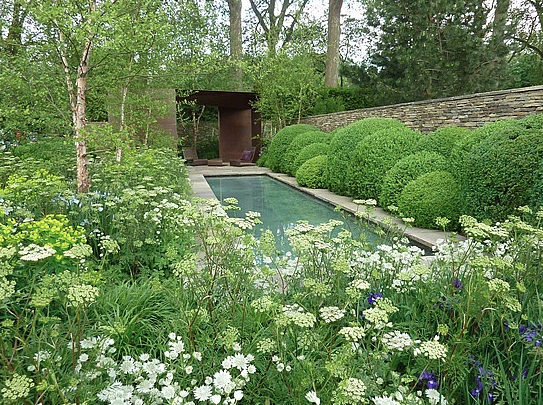 This more traditional design brings the garden back, a space that has been missing from previous examples but I hadn’t really noticed until now. Much of aspirational design can forget about the usability of a space or product and a design like this makes us see that both are possible. 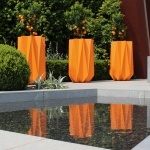 It provides a usable garden and social space along with contemporary planting and style. This is a show garden but it reinforces what I just said. 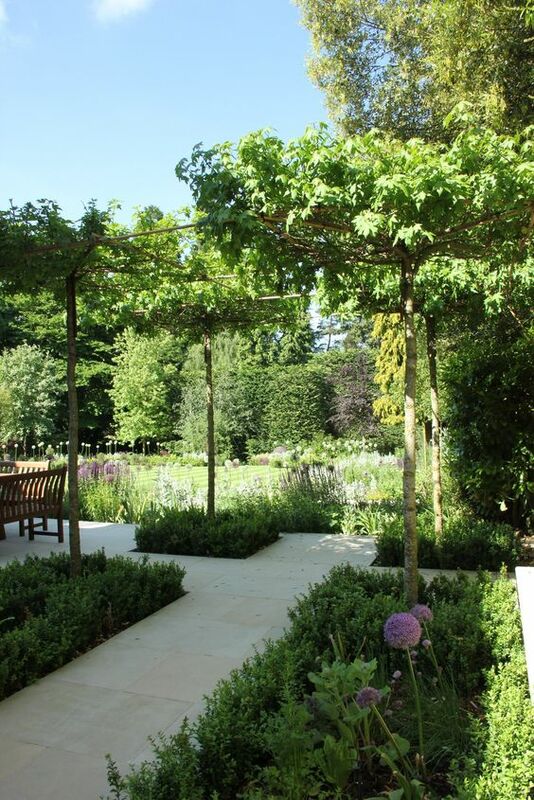 For the size of the garden there is very little usable space and it is all about feel like you in nature. The brief is different for different people but very few customers would want such a vast amount of dense greenery with so little actual usable space. Does look great though! 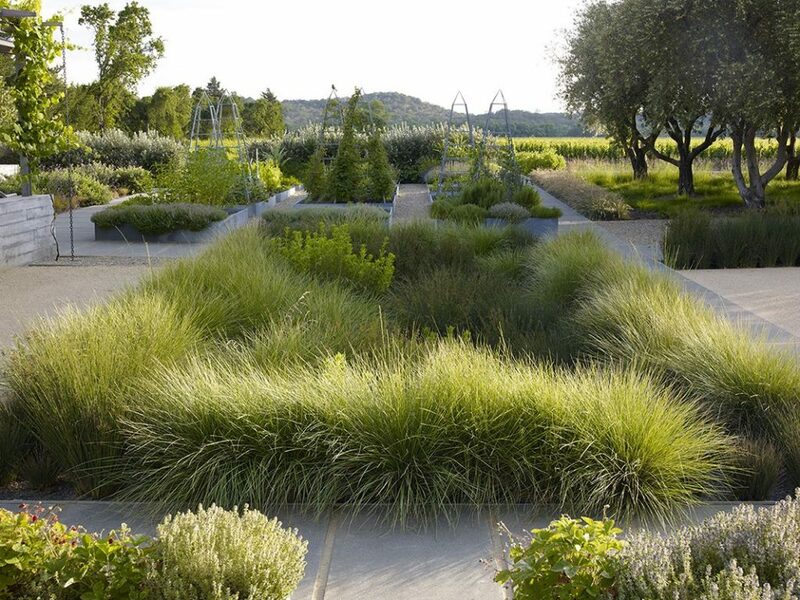 Space is certainly not an issue for this garden with the large rolling fields that extend out into the distance. The garden is usable as well with the central beds being used for herbs and food. It is possible to make a more stylish edible garden than most. 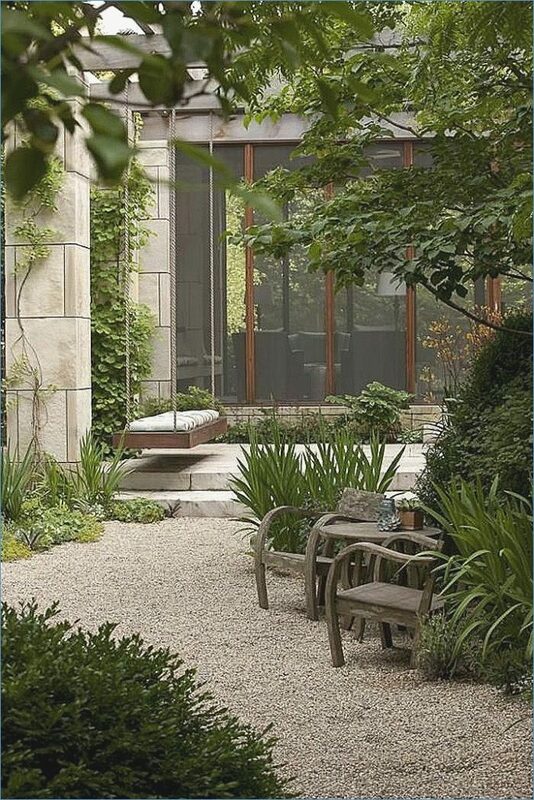 A small courtyard space is sometimes all that is needed and whilst this project is much more than that it does give an idea of how such a little garden can still look great and be usable.